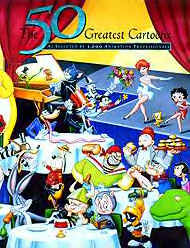 The 50 Greatest Cartoonsnote cartoon short films  neither full-length features nor television episodes are included is a list compiled in 1994 by animation historian Jerry Beck of Cartoon Brew, along with many others in the animation field. The criteria were that each cartoon be under 30 minutes long and cel animated (with Gertie the Dinosaur being the sole exception, since it predates cels). Tellingly, 43 of the shorts are from The Golden Age of Animationnote with two shorts from The Silent Age of Animation, two shorts from The Dark Age of Animation, and three shorts from The Renaissance Age of Animation; 17 of those are from the Warner Bros. studio (a full fifth of the list having been directed by Chuck Jones). Compare to The 100 Greatest Looney Tunes, which shares many of the Warner Bros. cartoons featured on this list. Loads and Loads of Characters: The cover spread (both front and back) has a whopping 67 different cartoon characters (all of them from the cartoons within) spread across it.